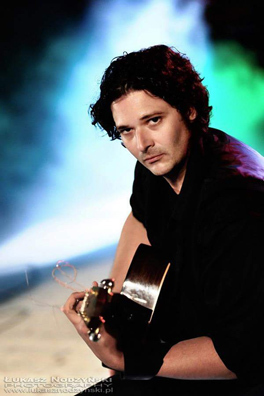 Andreas Kapsalis is a Greek-American guitarist and composer born in the suburbs of Chicago. His first exposure to music was through his mother, Frances, a student of opera, and his father, Peter, a violinist. Andreas began teaching himself guitar at the age of 11, reading and writing music as well as music theory. At the age of 18 he suffered a hand injury; during his recovery period, he began developing his 10-finger tapping techniques. Under the tutelage of composer and producer Jim Tullio, a student of Aaron Copland, he refined his compositional approach on the guitar using these techniques. Tullio produced Andreas' first EP with Andreas' arrangement of Dave Brubeck's composition "Blue Rondo a la Turk," which garnered attention from the composer himself, who said, "I am very impressed that Andreas could cover on guitar what I had written for piano. It is quite amazing to hear my own music performed by great instrumentalists." two discs featuring his compositions. While performing in LA he was invited to apply for the Sundance Composers Labs. He was awarded the fellowship, an honor awarded to only six composers a year. This was his initiation into film composing. At the end of the Sundance Composers Lab, Andreas was invited by the directors to complete a score for their documentary film "Black Gold" among the documentaries selected for the January premier at the Sundance Film Festival. Founder of the Sundance Institute and Festival, Robert Redford, noted this was the first time in Sundance Institute history that documentary fellows and a composer fellow had an "official selection" at the Sundance Film Festival. Subsequently, he composed scores for several documentary and feature films such as "Pig Business" and "Mulberry Street" to name a few. He also has been commissioned by Northwestern University and Notre Dame to compose music for their silent film festivals as well. Following this, Andreas performed and recorded several discs with Polish singer/contra bassist Megitza and the AKGI duo. concerts have taken place in Germany, Austria, Poland, and Slovakia. More recently Andreas was invited to Armenia to participate in "Sounds of Peace," a musical exchange featuring 60 artists from 10 different countries. 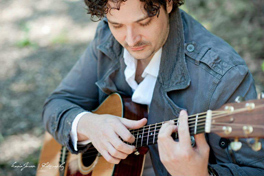 Along with his years of experience as a touring musician he has also enjoyed teaching guitar, conducting masterclasses as well as private instruction in Europe, Asia, and the United States. Andreas is currently touring extensively throughout the U.S. and Europe to promote his second solo release titled “Andreas Kapsalis Live at The Old Town School of Folk Music" recorded live in Chicago. He continues to be inspired and is eager to share the beauty of music and how it can enrich one's life.